1. Is it okay to paint a very small bathroom a dark color? I love a dark sea blue with white trimmings (window sill, shower curtain, vanity), but would that close it all in? 2. Do I need to use a special type of paint for the bathroom? The one on the wall now appears to be glossier than a normal semi-gloss. 1. 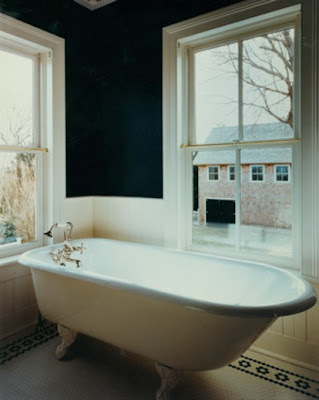 If painting your small bathroom a dark color will make you happy and excited as you shower every morning, then you should absolutely paint it dark. Immediately. But beyond just satisfying yourself, I think it is a great idea. 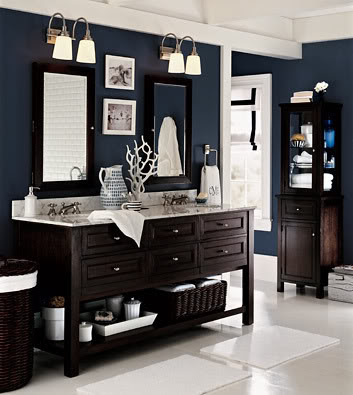 Punches of deep color on a bathroom wall, large or small, can be a beautiful effect when contrasted against white. If you have white fixtures, a white floor or if you get a good bit of natural light in the bathroom, painting it in a rich tone can be chic and dramatic. The key is balance to avoid that cavernous feeling you allude to. Also, if your bathroom is tiny, embrace its tinyness. Painting it a deep color can cozy up the space and make it special and inviting during your daily routines. No need to fight it to make it feel bigger and spacious - make it a small retreat for yourself. If you keep the accents white, it won't feel like a cave. A nice sea blue - this bath even opts for dark furniture, which works as it seems to be spacious. The light flooring, trim and countertops, as well as the towels and decorative accessories, make for a lovely contrast with the blue. Glossy chocolate brown contrasted with white. A daring choice, but overall, a tame look. Oh, this is lovely. Brown and beautiful. Rich and inviting. 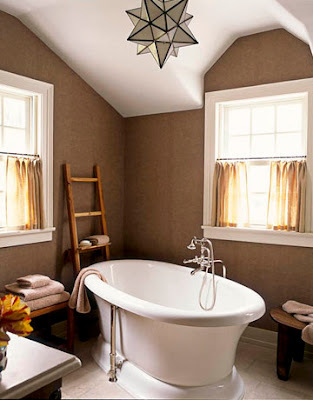 A cool light fixture always perks up a room - even the bathroom. Woah Nelly! This will wake you up in the morning in an awesome way. I am in love with that chair. 2. 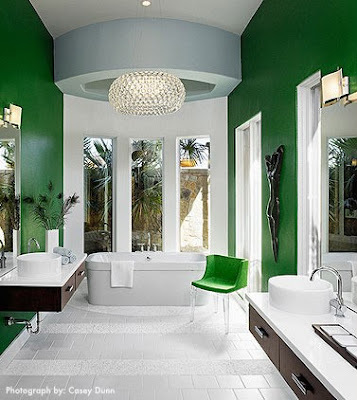 As far as paint sheen - bathrooms are often painted in a higher sheen like a semi-gloss because glossier paints resist moisture better than flat paints and they are easier to clean. Personally, I would stick with at least an eggshell sheen in the bathroom, but I think painting semi-gloss would be great to give the room some extra sparkle. Or think of painting it in a gloss sheen for a lacquered look. Dark and glossy with white and crisp can look very nice. If your walls are already glossy, give them a light sanding or apply a coat of primer to make sure that your next layer of paint sticks nicely - painting right over glossy paint can sometimes yield iffy results. 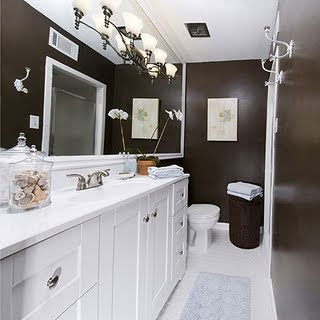 Great post-in a very small bathroom or powder room, I like to continue the dark color on the ceiling. It actually makes the room seem larger, since there is not a break in color. I have done this with red, navy blue, and dark green and it is gorgeous. My mother has a beautiful large-patterned leaf wallpaper that extends to the ceiling in her small half-bath. It's very dramatic and actually, like SR2 mentioned, makes the room seem larger. Elise - I love a wallpapered ceiling! Sheila, these are some savvy ladies - give your ceiling some love as you contemplate your plans. Brilliant -- my bathroom is teeny tiny, so any tips on making the space bigger are very welcome.